Zelda Williams is currently single. Previously, she was in a relationship with American actor Colin Donnell. The duo began dating in 2012 but separated in 2013 after being in a year of the relationship. As she has openly declared herself as a bisexual, but she has not been seen dating any other women. Also, she was in a relationship with actor Jackson Heywood from 2013 to 2016. Currently, she is single and residing in San Francisco with her family. 1 Who is Zelda Williams? 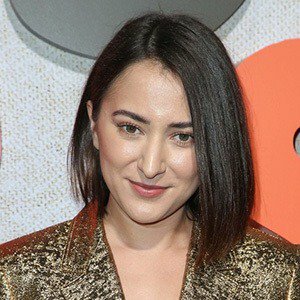 Zelda Williams is an American actress and director who is well known for her performance in ‘Were the World Mine’ in 2008, ‘The Legend of Korra’ in 2012 and ‘Never’ in 2014. Zelda was born on July 31, 1989, in New York City, USA. Her birth name is Zelda Rae Williams and she is currently 29 years old. Her father’s name is Robin Williams(actor) and her mother’s name is Marsha William. Marsha is the second wife of Robin and Marsha is of Filipino and Finnish descent. Her name was stated after Princess Zelda of ‘The Legend of Zelda’ video game series. She has got a younger brother named Cody and half-brother Zachary Pym ‘Zak’ Williams. She is also the cousin of Jennifer Garces, niece of Dr. Toad, and granddaughter of Laurie Williams. She grew up in a high profile film family, thus, the film world was not strange for her. She accompanied her father in many film sets and made herself attached to the American film industry. As her father worked in L.A. and wanted his children to be away from the limelight, Zelda spent most of her childhood in San Francisco. She had already developed her interest in acting since her early childhood but she was still in the dilemma of finding her true passion. And, ultimately, she made her decision to continue her career in the entertainment industry. Also, she developed her passion for directing movies. Her father committed suicide in August 2014 because of depression. She was emotionally devastated and stated that she wanted the world to know him as a good man who had devoted a lot of time to charity. Zelda holds American citizenship and her ethnicity is a mix of English, Welsh, Irish, Scottish, German, French, Filipino, Finnish. Regarding her education history, Zelda has not disclosed information about her education. However, it is under review. She made her on-screen debut from the age of 5 after she played a small role in the TV film ‘In Search of Dr. Seuss’ in 1994. After that, she started her acting career with commercial success. She debuted her big screen from the film ‘Nine Months’ in 1995 in which she was featured as a little girl in a ballet class. She took a break from her career for 9 years and made her comeback with the film ‘House of D’ in 2004 in which she played the role of Melissa. Again, she took a break for 4 years and came back with the film ‘Were the World Mine’ in 2008. Zelda made her appearance in the films like ‘Don’t Look Up’, ‘See You on the Other Side’, ‘Jezuz Loves Chastity’ from 2009 to 2010. She portrayed the leading role in the independent film ‘Never’ in 2014, in which she was played as a lesbian woman developing a bond with a straight man. She gave the voice of Kuvira in the animated series ‘The Legend of Korra’ in 2014 and of Mona Lisa in another animated series ‘Teenage Mutant Ninja Turtles’. Recently, she made her appearance as Melissa Miller in the episode ‘Falsi Flag’ of ‘Criminal Minds’ in 2017. She was appeared in People magazine’s ‘100 Most Beautiful People’ in 2007 and made her cameo appearance in the Cobra Starship music video ‘You Make Me Feel’, alongside her father. She won Domani Vision Award in the category Best Lead Actor for ‘Never’ in 2014, won BTVA People’s Choice Voice Acting Award in the category Best Vocal Ensemble in a Television Series-Action/Drama for ‘The Legend of Korra’ in 2015 and nominated several times in her career. She has an estimated net worth of around $2 million and she has accumulated that sum of money from her professional carer. She is openly bisexual. Also, she wants to sell her Mediterranean villa for $3.2 million which she picked up in 2011 for $1.876 million. Zelda also quit Twitter and Instagram after being taunted of her father’s death. But, currently, she is active in social media. She has a height of 5 ft. 4 inches and she weighs 52 kg. Also, Zelda has got hair and eyes. Her body measurement id 34-23-34 inches. She has around 171k followers on Instagram, and around 270k followers on Twitter but she does not seem to be active on Facebook. To know more about birth facts, family, profession, awards, childhood, education, net worth, rumors, body measurements and social media profile of Sarah Sokolovic, Marla Sokoloff, and Drew Sidora, please click on the link. A Chair devoted to Comedy at SCA in Robin Williams’ honor: Tribute to the World’s greatest comedian on his 66th birth anniversary!